A man who has been protesting on a bridge on the Devon and Cornwall border is continuing his action more than 24 hours after he began. Jolly Stanesby, 35, a registered childminder from Ivybridge in Devon and member of the pressure group Fathers 4 Justice, climbed onto the gantry over the Tamar Bridge at Plymouth on Friday morning. He was joined by three other protesters, two men and one woman, at the beginning of the demonstration. They were later arrested. 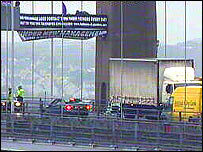 The protest caused rush-hour traffic tailbacks on the Devon and Cornwall sides of the bridge on Friday morning. Traffic was not affected on Saturday morning. A Devon and Cornwall police spokeswoman said officers remained at the bridge and they would wait until Mr Stanesby came down. The three people arrested in connection with the protest have been released from police custody. Mother-of-one Jayne Woodman, 36, a human resources manager from Swansea, south Wales, was released without charge. A 38-year-old man and a 46-year-old man, both from London, were released on police bail to return at a later date. The demonstration on the bridge has prompted a review of security measures. Bridge Manager David List said additional security measures were introduced after a previous protest by the group on the bridge last October. "We thought we had the balance right, but we'll review it again. "There are other things we could do, but they could inhibit maintenance and other aspects of the operations."